Wow, this is really an interesting thread and I like the psychotic sounds this synthesizer makes also !! The "FM Techno" tune is very cool ... I like the 18F4xxx chips. They are cheap and fairly powerful as one can tell by the samples !! I guess it would not be hard to synchronize it to some external source by patching over the parameter pots and using an external LFO (be wary of the voltages) to modulate some of sounds ... The external patched LFO's can be rectified and attenuated if need be. I am embarrassed to say that I can't work out what is going on here. I followed the link to the explanation but it seemed to explain very little. Is it a pseudo-random (or less than random) number generator? I can't seem to grasp what the basic idea is. The Game of Life stuff is really cool and the algorithms result can be used to generate control data for a particular parameter of a sound such as FM Index or something like that. The bottom line here is, it sound cool !!! I did get hold of the code from the author and there's a bit of commenting but it didn't get me that far to be honest Although I might have a play with the "user interface" side of things if I get a chance! I am definitely building this as soon as the PICs arrive! I have a costume party/rave to go to in a few weeks, and needed a small, battery-powered synth to take as part of my costume ("The Oscillator," a synth-themed superhero). Should be fun. I'll report here on my experiences with the circuit. I've also successfully built a couple of the Electric Druid PIC-based designs, and will post my boards and notes in the other thread as soon as I can put it into a form that makes sense to someone other than me. simple lofi audio hardware to realize some unusual sounds. 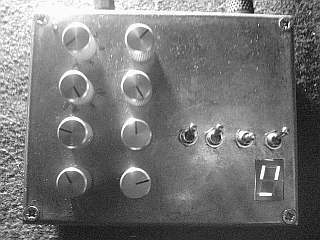 I once tried to make some sounds on a pic 12 and was not very impressed by myself then. Well Jan, I would say without hesitation, that if you had a more powerful processor than the 12x and spent more time, I am most sure yours would be cranking out the cool sounds also !! I am most sure yours would be cranking out the cool sounds also !! 1 =select Synth (1..x) -> "DSP_xxx"
I've tried to greate a simple framework sort of a plugin system. The "application" manages the user inputs and calls the "DSP_Alg" functions according to a software timer (maybe this should be done with the hardware timers but I don't want to use interupts. 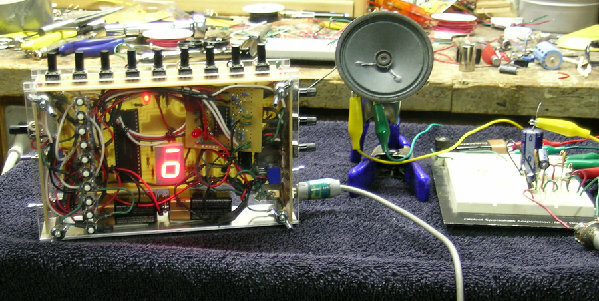 "api" gets the analog inputs and puts out PWM sound. the application, should be worked out more. only the "DSP_xxx" sound calculation has to be created. Maybe some of you get interested in writing some synth-plugins. So not much C programming knowledge is needed (only the math). thanks Joel for mailing me and the positive feedback! The PICs were on my doorstep when I got home. I breadboarded the circuit, programmed it with my PICkit2, and...it works. Eric, my hat is off to you--this is a very cool little synth. Some amazing and quite insane sounds are possible. My neighbor came downstairs to see if something was wrong with the washing machine. Thanks for sharing it with the synth DIY community! I'll have pictures and (maybe) sounds once I get it onto a board and into an enclosure--the plan is to wear it/play it on my chest. I should be getting 3 chips by next week I hope !! 4/14. Look like it will be a fun project, And it does sound Cool . I see that a serial pin is available on the MCU, seems a good place to hang a serial LCD of some type off this?? Not a very expensive one. Maybe 2 x 20 is all that may be needed. I'm glad you got it working Ole. a SPI EEPROM 25LCxx or MMC/SD card if a lot memory is needed. I've choosen the LED display because of easy/cheapness and it needs very little performance to interface (compared to an LCD). the PIC is no PC nor DSP, all should be kept as simple as possible. Why C ? - Assembly is much more efficent. but that can be very interessting thinking of circuitbending. I put this together this afternoon, sounds great!! One issue: the sequencer program (#3) didn't work at all - all I got was a series of rhythmic clicks, no tones? I bought a couple of 18f4620s from ebay but the wonderful royal mail mislaid them so the guy sent me an 18f4520 and 18f4685 instead. I've tried each (recompiling the code with the appropriate header in each case, and for the 4520 removing a couple of unused variables as it said there wasn't enough ram) and get the same problem on both. Anyone had a similar problem? In the "Application.c" a 2kByte Buffer is allocated (array), this is not needed yet. You can of course delete this lines or comment them out if another PIC is used. If you change the Step-number pot, the Step-value pot is locked. To unlock it you have to fetch the old value with the Step-value pot. Turn pot from left to right (or in the other direction). changes now the selected step value. Be sure if you use another PIC that it has a internal 8MHz oscillator. I am curious why you stayed away from interrupt driven code. It make life so much easier ?? The 18Fxxx has so many hardware timers to do the task management or to set sample rates. Yes, thats the best way I think also. Very nice examples made with this PICsynth! As far as fractal 2 sound is concerned (on PC that is), I've used FractMus. It renders fractal algorithms into MIDI format. I'm not a MIDI fan, but it can be transformed into a sound file. (sorry if OT). got three 18F4620 MCU's in the mail today !!! Here's my version. I had to add a filter (a state variable SEM clone, thanks to Takeda-san and MFOS), an LFO, and a tiny button keyboard. The small LM383-based amplifier and speaker will go into the mask--pictures of that coming as soon as I get it made.